Warwick Long Bay beach is a long and magnificent half a mile stretch of pink sands. Against a backdrop of grape & cedar trees, and low grasses, the beach looks fabulous. 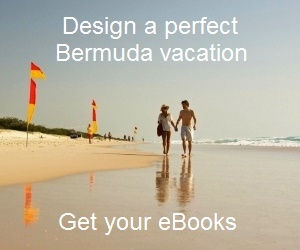 It's one of the most picturesque beaches of Bermuda. Warwick Long Bay lies on South Shore Park in Warwick parish and to the east of Horseshoe bay beach (i.e. to the left as you face the water) and is connected by a sandy trail passing through several other lovely beaches along the way. The beach is full of little coves and rocks. The main entrance to the beach is at the west end (i.e. right-end as you face the water). A short road winds down from South road to the car park, and the beach is only few steps below. From the car park, instead of going down the steps to Warwick Long Bay beach, you can take a sandy trail on the right which leads to Jobson’s Cove, another beautiful small beach surrounded by rocks a short distance away. Warwick long bay is an ideal beach if you want to escape from the typical beach crowd. Several sections of the beach remain quiet and secluded most times. And therefore you can always find a private place on the beach for yourself particularly towards the eastern end (left end as you face the water) where you will see several private houses. Warwick Long Bay actually covers an area of several beaches including Warwick Long Bay, and towards its west Jobson's Cove, followed by Stone hole Bay, and then Chaplin Bay. The largest of them is Warwick Long Bay and marked by two huge boulders offshore at the western tip of the beach. There are several rocky outcroppings. If you can climb them, they can be photographers paradise. It’s also a favorite location for early morning swimmers, joggers and the occasional horseback riders. The steep cliffs and shrubs that cover the hills offer good privacy to sunbathers. There is a coral reef less than 60 meters from the shore and the reef seems to be floating on the water. Despite frequent winds, the waves here are surprisingly small due to this offshore reef. There are excellent snorkeling areas all along Warwick long bay beach. However the shallow reefs that come out of the water during the low tide can be a little tricky to negotiate. Large number of parrotfish feed along the water edge in the late afternoon. You can see them from the beach. It's a wonderful sight! But the drop off at some places are quite sharp, so you should be careful particularly with kids. There is a public toilet at the western end of Warwick long bay beach accessible from the car park. During the summer time, a lunch wagon supplies light snacks like hot dogs. A concession stand here rents snorkeling gears in summer. There is a nice children playground close to the beach and accessible from the eastern end car park. The playground is equipped with a fun fort with slides and tunnels, swings, shady trees with benches etc. You will see plenty of birds around the park. From one side of the playground, a trail leads down to the beach below through bushes and grassy land. Update May 29, 2013: CNN has ranked Warwick Long Bay Beach as #29 in the list of World's best 100 beaches. Pink coral sand, quietness, access to secluded coves were some of the criteria. Update October 2013: UK Telegraph has ranked Warwick Long Bay Beach as the #10 out of the 13 best beaches in the Atlantic and Caribbean region. Visit the Beach Map to see the location of Warwick Long Bay and other great beaches. Located in Warwick Parish, the beach is accessible from South Road and on bus route #7 that runs between dockyard (Kings Wharf) and Hamilton City. It takes about 40 minutes from the dockyard by bus. By taxi it takes about 35 minutes. A paved road off South Road at the western end of the beach goes down to a car park (accessible by taxi/scooter), and the beach is only 4-5 steps down a short stairway. From the eastern end also a short paved road comes to a car park, and from their a sandy pathway (about 20 meters) leads down to the beach. 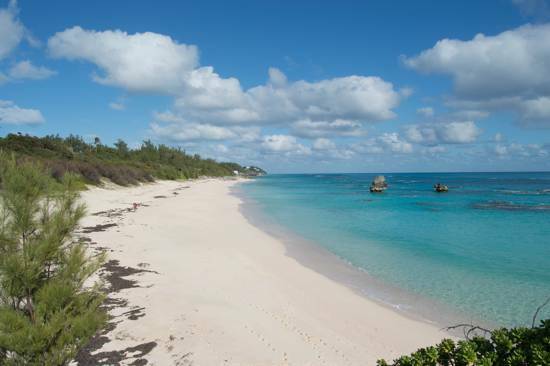 1) Top beaches of Bermuda: Know about all the great beaches in Bermuda. I have to say that your details on the beach at West Whale Bay Park was my highlight. I did rent a scooter, having past experience owning a motorcycle, and being able to go to that beautiful beach, and having it to myself for an hour, was an experience I will hold in my heart forever. I do not really want it publicized too much so it is not spoiled since most people like me who arrive on a cruise ship go to the Horseshoe Bay Beach, it was wonderful having info on a great alternative. Being there and even with a disability being able to take my time and get down there and have private natural time there was so wonderful. Thank you for that tip. Even when others showed up it was a group of kids from Bermuda with their handlers and seeing them enjoy their island beach was joyful. Hi, Thanks for your great web-site! I've found so much info on it. I've read some conflicting info about the rental of chairs/umbrellas at Warwick Long Bay beach. Most of what I've read said there are not chair/umbrella rentals there but someone who was there in 2015 said there was a concession stand renting those items. As some in our party need a chair/umbrella, can you tell me if chairs/umbrellas can be rented at Warwick now? Also, if not, could someone walk to Horseshoe and rent a chair there and carry it back to Warwick for the visit - or would it be too long of a walk? Thanks! Hi, sometimes you can get chairs/umbrellas from the make-shift tent adjacent to the lunch wagon at the car park of Warwick long bay. They have limited stock and are open usually in summer. Horseshoe beach is over a mile from Warwick long bay. Secondly, the concession at Horseshoe won't allow the chairs and umbrellas to be taken out of the beach area.